My local Poundstretcher has in the Christmas tubs for 89p. Saw them in tesco the other day for around £3.20 on b.o.g.o.f. But 89p is SERIOUSLY cheap. You know Christmas is here when shops start selling CHEESE BALLS!!! I love em. The wife thinks they're dirty though. Should be scorching, Tesco have these on offer £3.20 and BOGOFF so £1.60 for 1 but your forced to buy 2. Also saw them on offer at Asda (£2.40 ish on Saturday) but not BOGOFF so for 89p these are a cracking deal especially at Christmas. This is seriously cheap.... Anyone know if this is nationwide. ? doesnt answer your question, but hope that help. I'll give it a punt tomorrow. dont want to say "its nationwide" and get flamed, but I bought mine in … dont want to say "its nationwide" and get flamed, but I bought mine in Leicester and the other half got some in Loughborough. So its definitely more than one storedoesnt answer your question, but hope that help. 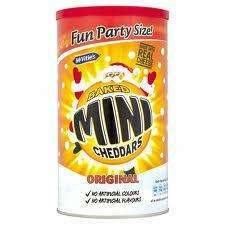 I just love getting the cheesy balls out on christmas day, the family cant get enough of them. Would never pay more than £1 for them - 89p's super.